The Packers can claim their third straight NFC North title by beating Pittsburgh and division-leading Chicago at Soldier Field. Back-to-back come-from-behind victories have the Green Bay Packers in control of their postseason chances, but they’ll have to make do without Aaron Rodgers for at least one more week. Rodgers will miss his seventh straight game due to a fractured left collarbone Sunday against the visiting Pittsburgh Steelers, leaving Matt Flynn under center again as the Packers try to keep pace in the NFC North. Coach Mike McCarthy said Thursday that Rodgers looked good and thought he was ready to play but stressed that didn’t constitute a clearance to return. On Friday, the team announced that wouldn’t be coming for at least another week. McCarthy said Rodgers has not received medical clearance yet, and that the organization feels Rodgers is not ready to play. That means Green Bay will have to go without the QB who has thrown for 687 yards and six touchdowns without an interception in two career meetings with Pittsburgh (6-8). In the most recent, he was 24 of 39 for 304 yards with three scores to earn MVP honors in a 31-25 victory in Super Bowl XLV. Since averaging 15.5 points while going winless in four games after losing Rodgers, the Packers (7-6-1) have found an offensive rhythm with Flynn in their last two. He’s gone 50 of 71 for 557 yards with five touchdowns and two interceptions while rallying Green Bay to back-to-back victories. The Packers trailed visiting Atlanta by 11 at halftime before pulling out a 22-21 win Dec. 8, then stormed back from a 26-3 halftime deficit to stun Dallas 37-36 last week. Flynn led the team to five straight touchdown drives to open the second half as Green Bay matched the greatest comeback victory in its 93-year history. "We’re about getting ready for the Pittsburgh Steelers, but it’s an excellent team victory," McCarthy said. "Can’t say enough about our football team, can’t say how proud I am of each and every player just to stay the course, and that’s exactly what they did." The Steelers also remain alive for a postseason berth following a 30-20 win over AFC North-leading Cincinnati on Sunday, though they’ll need a lot to go their way over the final two weeks. Pittsburgh has to win out against the Packers and Browns, and have Miami, New York, San Diego and Baltimore finish with 8-8 records for the tiebreakers to work in its favor. 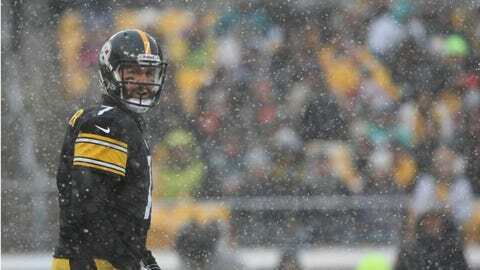 "I have said for a bunch of weeks now that there is going to be no quit from me or from anybody," said Ben Roethlisberger, who completed his first 13 passes and ended up 20 of 25 for 191 yards with a touchdown and an interception last week while setting a team record for completions in a season with 340. Since committing 15 turnovers – 10 interceptions – over his first nine games, Roethlisberger has two giveaways in his last five contests. He’s thrown 12 touchdowns and one pick over that span. In his only regular-season meeting with Green Bay, Roethlisberger threw for a team-record 503 yards and three scores – including one on the final play – in a 37-36 victory over the visiting Packers on Dec. 20, 2009. Antonio Brown has been Roethlisberger’s top target this season, reaching career highs with 95 catches for 1,307 yards and eight touchdowns. He scored for the fifth time in as many games in last week’s win. Green Bay’s Eddie Lacy will try to find some holes in a Pittsburgh defense that’s allowed fewer than 75 yards rushing in three of the last four games. The Steelers, however, will be without linebacker LaMarr Woodley for the rest of the season because of a strained right calf. Defensive end Brett Keisel, who has missed four of the last five games with plantar fasciitis in his left foot, will return to help contain Lacy, the Packers’ first 1,000-yard rusher since Ryan Grant in 2009. The rookie ran for 141 yards on 21 carries last week while adding his seventh touchdown in nine games. The Packers have won two of three meetings in Green Bay. This is the teams’ first matchup since 2005.